Welcome to a review of the new Garmin Fenix 5 (Amazon). We'll take you through everything you need to know about the Fenix 5, 5S and 5X, Garmin's latest top line sports watches. Garmin has launched not just one but 3 watches in this 2017 update. They are attempting to leave no stone unturned and are catering for the masses with this 2017 release. If you're after a sports watch which looks just as good as it performs then look no further, Fenix 5 is the best (naturally unbiased opinion)! If you have any questions or if you feel we've missed something and you would like it added please leave a comment at the end of the review. We'll happily add your thoughts (no spam please!). There's also a really useful Facebook group run by enthusiasts. I'd suggest joining for tips and tricks on how to get the most from your watch. Disclaimer: This site has been created as a dedicated buyers guide to the Garmin Fenix range of GPS sport watches. It's run by fans of Garmin - we simply love their technology and enjoy writing about it. We hope you enjoy the content and find it useful! STOP PRESS! What happened to Fenix 4?! What's new with the Garmin Fenix 5? Is Fenix 5 worth the money? Fenix 5 is available in an incredible array of colors, styles, sizes, different bands, materials etc. You can easily customize with the new QuickFit bands. (quick release, no tools required). Simply style Fenix 5 to match your training kit or go for a dumbed down version (if you don't like to show off). Personally, I love this 2017 version. In my opinion, it's the best watch Garmin have ever released. Don't get me wrong, there are other great watches out there (see ﻿﻿Suunto Tr﻿averse, Ultra, ﻿Kailash﻿﻿ etc at Amazon) however Garmin are the original pioneers of GPS wearables and have spent years perfecting each version, adding new and exciting features which will help make you a better athlete. Garmin has released other good looking watches. The Fenix Chronos was a fine example. However far too heavy, pricey and totally impracticable for outdoor sports. If money is no object then, by all means, add this to your collection as it still looks great. I just wouldn't wear it for my next triathlon. Garmin seems to have a habit of not ordering new products in a logical way. However, from what I've read it's something to do with the Chinese and how they pronounce the number 4 (translates as ‘fast rise to quick death’). Garmin's main factory is in Taiwan and probably not the start they wanted for a new product launch! Garmin seems to have a habit of not ordering new products in a logical way. However, from what I've read it's something to do with the Chinese and how they pronounce the number 4 (translates as ‘fast rise to quick death’). Garmin's main factory is in Taiwan and probably not the start they would like for a new product launch! The new Fenix 5 ﻿﻿bands (Amazon) are easily interchangeable and just clip in and clip out without the use of a tool. This is ideal if your version comes with a leather strap and you want to swap to silicone for your training session. Worth noting: Fenix 5 and Fenix 5X Sapphire watches come with a second set of QuickFit bands in the box. One noticeable update is the improved heart rate sensor in the rear of the watch. The optical sensor is now flush with the back so you won't get that indentation in your wrist after wearing for a long period. A new performance widget keeps track of your progress and your most important performance indicators such as Training Status, VO2 Max, Training Load and Recovery Advisor. These features can help you train more efficiently and keep you informed about your progress. You can get improved battery life and better tracking accuracy by using extended UltraTrac mode (battery life up to 100 hours Fenix 5 and 5X / 50 hours Fenix 5S). There's also support with additional external sport sensors through ANT+, now also supported through Bluetooth. Fenix 5X also has new features not previously seen in the Fenix range, more akin to a handheld device. These include preloaded color maps for navigation featuring points of interest (POIs), waypoints and other map objects. This could prove useful for trail runners, orienteering etc. You can also plan a round-trip course via Garmin Connect and send it to the watch for a run or bike ride. Fenix 5 will display 'at-a-glance guidance' for upcoming turns on your route. Let's take a look at each model in the range. Each version comes in a variety of colors and band options so you really need to check what you're actually getting in the box. Fenix is designed for a range of active people, from those that are seeking a rugged and stylish watch with a wrist heart rate monitor to others that live for performance. Navigation features in the 5X will be useful for those that need situational awareness but don't necessarily want to a handheld GPS device. One problem with the last version was the size. Some women like chunky watches, however, the standard straps/bands weren't always a great fit for small wrists. The Fenix 5S should appeal to women for this reason. It has all the same features but a slightly smaller band (20mm) and display (42mm 218x218px). It's still packed with advanced features such as wrist heart rate, multisport profiles, and advanced tracking metrics. I expect the Fenix 5 to be the version which appeals to the masses and a slightly better price point over the 5X. It has all the sport profiles and performance metrics but lacks the topographic maps. Fenix 5 also includes 3-axis compass, gyroscope and barometric altimeter for on the trail. The Sapphire versions come with Wi-Fi for connected features such as smart notifications, automatic uploads to Garmin Connect and customization with Connect IQ. How do I charge the Fenix 5? Garmin has designed a smaller charging cable and plans for this to be the start of a universal charger design for all their watches. Unfortunately, it connects behind the watch so can't be charged when it's being worn. It can still be connected to an external battery pack and has a strong magnetic connection. so if you can figure out a way to have on your backpack during al ultra you should be fine. How do I change the watch bands on the Fenix 5? You can change the bands simply by popping on and off using the new QuickFit mechanism, no tools are required. What are the Fenix 5 band and display sizes? Are QuickFit bands compatible with Fenix 3? Yes, the 26mm wide QuickFit bands are compatible with the Fenix 3 HR and Fenix 3 Sapphire versions. Available in leather, metal or silicone. Which sports can I use the Fenix 5 for? Fenix 5 has built in sports profiles for running, swimming, cycling, golfing, skiing, snowboarding, paddle sports (stand up and rowing). You can also create your own multisport profile to suit your training. Can I use for daily activity tracking? Yes, Fenix 5 has all the 24hr activity tracking features found in their Vivo range. Activity tracking which includes, steps, calories, wrist heart rate, move alerts (which can be turned off), sleep and more. What is the Garmin Fenix 5 battery life? These watches benefit from a long battery life and are designed for athletes who will push the technology to the limits. What is the weight of the Fenix 5? How do I customize the Fenix 5 display? Visit the Connect IQ app store from either your smartphone or desktop computer. Downloads include new watch faces, data fields, apps, and widgets. Garmin is continuously working with developers to design new apps for their wearables. What are the benefits of a Sapphire screen version? The Sapphire screen will help reduce scratches and is worth paying for especially if you like to train or hike in testing outdoor environments. It's also worth noting Sapphire versions come with Wi-FI for automatic syncing/uploads to Garmin Connect. Other versions still have Bluetooth smart and USB for syncing. 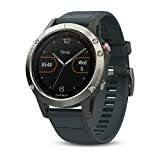 Can I store music on the Fenix 5? No, there is no storage for music on these watches. The storage on the 5X is for topographic maps only. Buy you can control music playing on your phone directly from the Fenix 5. Useful if you strap your phone to your arm during an activity. Can I change the map on the Fenix 5X? Yes, you can purchase a new map from Garmin and upload it via Garmin Express. Fenix 5X is compatible with topographical (outdoor) maps, BirdsEye imagery, BlueChart marine charts, and City Navigator street maps. How do I use the Fenix GPS for hiking? Select Hiking mode from the activity profiles menu and start activity. GPS will track distance, timer, elevation, ascent, speed and more. TracBack functionality can be selected from the menu and will guide you back to your start point. If you need to extend battery life during an activity, you can use UltraTrac mode to help save battery life. UltraTrac works by reducing the GPS signal strength and the built-in gyroscope helps to fill in the gaps. How does the Fenix 5 compare with Fenix 3 HR? Garmin has added new and improved functionality (see review) in this update. The watch displays are the same size although the 3HR bezel is slightly more raised which may give more screen protection. The optical heart rate is more flush with the back of the watch so you won't get that indentation in your skin. They have also added in Topographic mapping in the 5X. The QuickFit snap bands are also new, allowing for quick customization (compatible with 3HR). Fenix 5 comes in a range of sizes which is great for smaller wrists. Well done if you got this far! Seriously, there isn't much this watch won't track or give you feedback on. You can use it as a simple running watch (a bit of a waste but you'll be the envy of fellow runners) or you can use it for detailed marathon training. If you're after more than just a lightweight piece of plastic (see Forerunner 735XT) and want a rugged watch (that feels like a watch) then I highly recommend converting to the Fenix. It looks just as good with your white check shirt as it does with a yellow neon band on a long dark, winter run. Especially if you keep the backlight on! That's debatable at the moment considering the Fenix 3 HR price drop (see at Amazon). If you're new to the Fenix range but don't the money to splash then it could be worth buying the 3 HR until the Fenix 6 (historically Garmin release a new version each year), then trade in for the 5 as the price drops? The Fenix 5 will be hard to beat this year. It's right up there as one of the best watches for runners and wannabe athletes. Personally, I'm looking forward to what they release in 2018, can it get any better... Fenix 6?! Let's face it, Fenix 5 is an expensive piece of kit. BUT if you're serious about your training and also have the cash to splash I think it's a sound investment. Keep it for 2 years then sell it on eBay and put the money towards the next edition. Garmin Fenix 5 is the 2017 range of outdoor sport watches from the world leader in GPS technology. These stylish and tough watches will appeal to endurance athletes and outdoor adventurers seeking advanced training and performance features. Available in 3 different sizes: Fenix 5S (for smaller wrists), 5 and 5X (color TOPO maps).